If you've ever seen a dump truck pour a load of sand, you've watched the sand as it formed a conical pile behind the truck. Why conical? Because the sand can only support a fraction of its weight. As more is poured on, the pile collapses under its own weight. Now imagine what would happen to the pile of sand if you walked on it. It would collapse even more. Right? What if you drove a tractor on it? It's easy to perceive a canal bank as solid, but actually it is just like the pile of sand. If you add too much additional weight, the bank will collapse. If you and your tractor are unlucky enough to be that extra weight, it could be the last ride you take. Every year, farmers die when they drive a tractor too close to an embankment, and the collapse of the bank leads to an overturn. It happens quickly and with tremendous force, but it can be avoided. Equipment needs to be kept behind the shear line of the soil and embankment. The minimum distance recommended for operating machinery near embankments is a 1:1 ratio to the depth of the embankment. 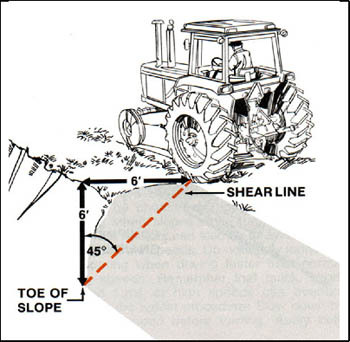 In other words, the tractor should be no closer to the edge than the depth of the embankment (Figure 1). Following this recommendation prevents bank collapse that can cause tractors to overturn thus crushing operators or drowning them in canals. This distance increases with adverse soil conditions such as sandy or wet soil. In some cases, it may be a good idea to move field roads farther from canals and ditches so that tractors are not forced to travel in the danger zone. 2. Carol J. Lehtola, assistant professor, Department of Agricultural and Biological Engineering, and Extension Agricultural Safety Specialist, and Charles M. Brown, Assistant Coordinator for Agricultural Safety and Health, Institute of Food and Agricultural Sciences, University of Florida, Gainesville, 32611.